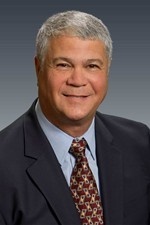 Rick Levy is a senior finance executive with over 35 years of experience in large and small companies, including international companies, and nonprofit organizations. Prior to joining CFO Selections (for the second time) he was the founder and Executive Director of a nonprofit focused on development and humanitarian work in several African countries. He has also been the Corporate Controller for Safeco Insurance, and spent seven years at Bank of America in various positions including CFO of the Bank’s International Private Banking division, and CFO for Bank of America – Australia. He has lived in Hong Kong, Manila, and Sydney, and conducted business in many European and Asian countries. 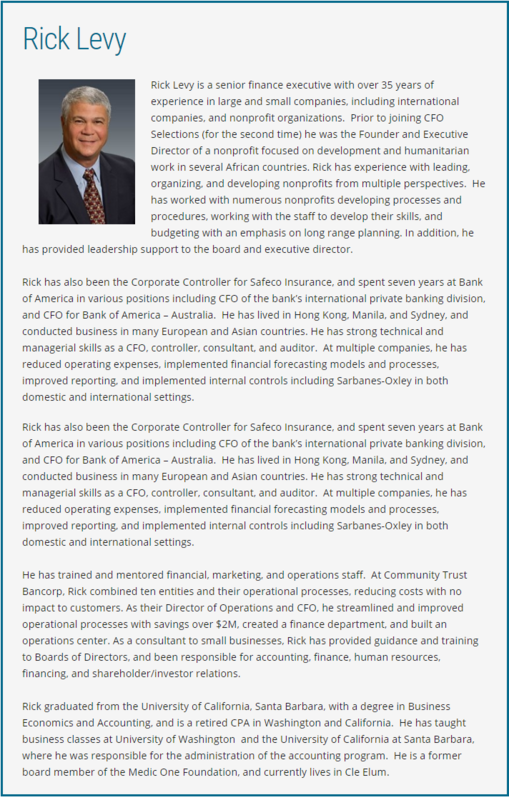 Rick has strong technical and managerial skills as a CFO, controller, consultant, and auditor. At multiple companies, he has reduced operating expenses, implemented financial forecasting models and processes, improved reporting, and implemented internal controls including Sarbanes-Oxley in both domestic and international settings. He has trained and mentored financial, marketing, and operations staff. At Community Trust Bancorp, Rick combined ten entities and their operational processes, reducing costs with no impact to customers. As their director of Operations and CFO, he streamlined and improved operational processes with savings over $2M, created a finance department, and built an operations center. As a consultant to small businesses, Rick has provided guidance and training to Boards of Directors, and been responsible for accounting, finance, human resources, financing, and shareholder and investor relations. Rick graduated from the University of California, Santa Barbara, with a degree in Business Economics and Accounting, and is a retired CPA in Washington and California. He has taught business classes at UC Santa Barbara, where he was responsible for administration of the accounting program. He is a former board member of the Medic One Foundation, and currently lives in Cle Elum.